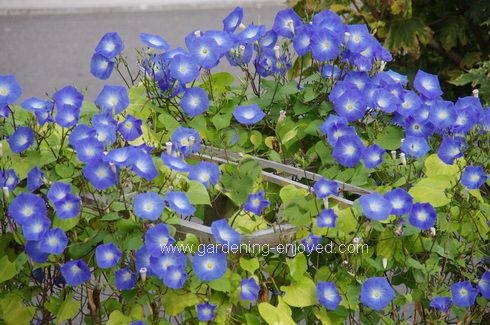 Dallying In The Dirt, Issue #305 - Heavenly Blue Morning Glories are marvelously well named. There’s only one true blue flower, in my humble opinion, and that’s Heavenly Blue Morning Glories. The flowers are so delicate and so vibrantly blue and I make sure that they are somewhere in my garden every year. This was a strange year in the garden and I thought I wasn’t going to have any. Late in May the little Morning Glory plants were interplanted with the Pole Beans as I have done for many years. This year the trellis was moved to a new location that was front and centre in the front yard to give me that vertical element that the garden needed. After I put up the little fence to deter the Rabbits, that seemed to like those little plants, the beans took off and provided us with many meals. I became resigned to the absence of Morning Glories and then after the beans had quit producing in early September the Morning Glories suddenly appeared as if from nowhere. As the very warm autumn continued they just got more and more glorious. This picture was taken on 21 October when these delights are usually long gone and they are still blooming today on the 28th. It looks like we will have Morning Glories in November. What a delight! This has truly been my best year ever for producing a fall vegetable crop. Partly due to my getting the seeds started on time and then planted out by the first of September, followed by the warmest fall weather we have seen in many years. They are all planted in the sub irrigation containers and they have flourished. 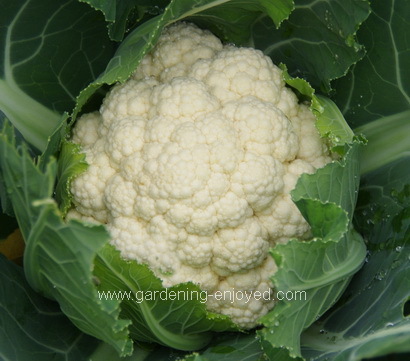 This is the second cauliflower to mature. We ate the other one last night. Wrapped in aluminum foil with some chopped Garlic and enough butter, that package sits on the upper shelf of the Barbeque for about 30 minutes and the result is heavenly. The plants grew quite large with lots of inner leaves so there was no need to tie them up to keep the sun away from the curds and as you can see they are a brilliant white. Tonight maybe steamed with a little Cheese sauce made with a nice sharp cheddar. Tomorrow the smaller bits into a stir fry with the Pak Choi and Napa Cabbage that are also producing well. November in a couple of days and we are still eating a wide variety of vegetables from our little garden. I may not have to go to the produce section of the grocery store until Christmas. The big garden rebuild continues unabated. 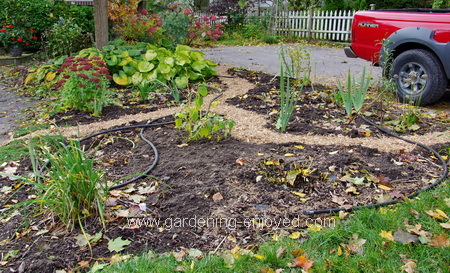 This is one of the large, and getting larger, perennial beds in the front yard. Many things have disappeared and many more have been relocated from the, now gone, beds in the back. I’m compensating for the slightly larger size of these beds by running some narrow paths through the beds so that I can more easily get into their interior to weed and adjust. Much deliberation ensued over the material for those paths but as you can see we wound up with the plain hardwood chips that you would find in a playground. They aren’t as permanent as stone or gravel and that is, at the same time, a good and a bad thing but mostly good. The little red truck is parked there because it brought in the ½ yard of chips from the nearby landscape supply yard. The path was excavated about 10 cm (4") and then filled with those chips. It makes an obvious path and it is easy to walk on. We did visit the local garden centre and take advantage of the season end 50% off sale to acquire a few new perennials to replace some of the ones we ripped out. You can see the newly planted perennial Hibiscus in the centre of the picture. The bed needed some late season colour and interest. There are now only the new bulbs to plant and that restoration will be completed. The other large bed on the opposite side of the yard is also nearly completed. Much hard work this autumn that is designed to make much less work in the years to come. Joan Asks? Love your newsletters! You are coming to speak at our Peterborough Master Gardener group in 2018. In regards to the developing begonia seed pod, when can it be pinched out the plant? Does the pod need to reach a certain stage? Ken Answers! I watch for the little stem behind the pod to turn brown and then remove the pod and take it inside to dry. You can just let the pod dry and turn brown on the plant but you risk it opening and the seed dispersing. Gord Asks? I have always just taken a couple of handfuls of leaves off of my sage plants. I see that you are recommending cutting the plant back to the ground. Do you leave any of the stem? Ken Answers! I'm not particularly fastidious about how low I cut them. They will regrow from the ground and most years from wherever you cut them to. If you cut them quite tall then you can wind up with a rather tall and rangy plant next year.